For TV Tuesday we talk about two shows with unique twists. First, we review the pilot of “Awake,” the new NBC series starring Jason Isaacs and created by Kyle Killen (Lone Star, The Beaver). Then we confess our love for “The Booth at the End,” a web video serial by Christopher Kubasik. In “Awake,” Isaacs plays Michael Britten, a police detective who survives a tragic car accident with his family. But it seems as if he’s now split between two worlds, one in which his wife Hannah (Laura Allen) survives, and the other where it’s his son Rex (Dylan Minnette) who lives. And he has a psychiatrist on both sides trying to help him sort it all out, played by B.D. Wong and Cherry Jones. In “The Booth at the End,” Xander Berkeley plays an unnamed mysterious man who takes up residence in a L.A. diner and makes deals with people who want something. Whether it’s money or true love, he can help make it happen, if you agree to do as he asks. But they’re not always simple tasks. Familiar faces include Sarah Clarke (24) and Timothy Omundson (Psych). ABC’s new paranormal adventure series “The River” premieres tonight on ABC. We weigh in on the first two hours for TV Tuesday. Created by Oren Peli of “Paranormal Activities” fame, the show stars Bruce Greenwood, Joe Anderson, Paul Blackthorne, Paulina Gaitan, Leslie Hope, Eloise Mumford, Shaun Parkes, Thomas Kretschmann, and Daniel Zacapa. Today for TV Tuesday we focus on FOX, starting with the preview broadcast of “Touch” starring Kiefer Sutherland, and moving on to the long-awaited broadcast premiere of “Alcatraz” starring Sam Neill, Jorge Garcia and Sarah Jones. “Touch” was created by Tim Kring, he of “Heroes” fame (or infamy), and stars Kiefer Sutherland as Martin, single dad to troubled son Jacob, played by David Mazouz. In last week’s “preview event,” airing well ahead of the show’s official premiere on March 19, we also met Danny Glover as all-knowing professor Arthur and Gugu Mbatha-Raw as skeptical social worker Clea. It was an ambitious pilot, but can the conceit be sustained over an entire series? Also, while we saw the first hour of “Alcatraz” at Comic-Con last July, it was a long wait before it finally hit the airwaves two weeks ago. Created by former “LOST” scribe Elizabeth Sarnoff (along with Steven Lilien and Bryan Wynbrandt) and backed by executive producers J.J. Abrams, Jack Bender and Bryan Burk, the show follows the history and new misdeeds of escaped Alcatraz inmates. What’s the real reason for their return? And do we have the patience to wait for the next big reveal? For TV Tuesday, it’s another single series showcase, as we explore the short-lived “Terriers.” It lasted only one season on FX, and for all its brilliance, it was the network’s lowest-rated new show ever. So even though it made dozens of “Best Show of 2010” lists, almost nobody saw it, and that’s a crime. Now “Terriers” can be found on Netflix, and we explain why it’s worth checking out. “Terriers” was created by Ted Griffin and starred Donal Logue as ex-cop and recovering alcoholic Hank Dolworth and Michael Raymond-James as former criminal Britt Pollack. The pair are partners in an unlicensed private investigation firm in Ocean Beach, San Diego, California. It’s a British period drama that’s one of the biggest hits on PBS. But don’t let that discourage you from visiting “Downton Abbey.” Recommended to us by several listeners, most passionately by Greg Marriotti of PixarTalk, we dove into the first season of this series and devoured every minute in time to catch the U.S. premiere of season two on Sunday. We were surprised at how compelling this super stylish and slightly soapy show turned out to be, following the lives of a noble family and the large staff that serves them. The ensemble cast of”Downton Abbey” includes Hugh Bonneville, Elizabeth McGovern, Michelle Dockery, Laura Carmichael, Jessica Brown-Findlay, Maggie Smith, Dan Stevens, Jim Carter, Phyllis Logan, Brendan Coyle, Siobhan Finneran, Rob James-Collier, Thomas Howes, Joanne Froggatt, and Sophie McShera. Is this new affection for “Masterpiece” one of the biggest indicators yet of our advancing age? Are you a fan of the Earl and Countess of Grantham? Or put out by the sibling rivalry among Mary, Edith and Sybil? Who can’t be charmed by John Bates, or grandma Violet? Before charging into the new year, we take a look back at the year that was. A “year in review” show is, perhaps, cliche, but 2011 was a good year for pop culture, and most certainly a special year for Popspotting. We saw more movies, watched more TV, tried more new music than ever before, as a result of having the pleasure of putting out this podcast, and the benefit of many wonderful and thoughtful listeners. Today we recount the best movies and new television shows of 2011 (and touch on the upcoming Golden Globes), as well as share our favorite music, book, and app picks. And we’d really like to hear what you would crown as the “Best of 2011”! In November, we gave our first impressions of several new fantasy shows, including ABC’s fairytale drama “Once Upon a Time.” We liked it, but didn’t love it… but many of our listeners urged us to give it more time. We’re happy to say that we stuck with the series, and now, we’re pretty smitten. We update our review as we await the next new episode this Sunday. Then, we discuss the season finale of “American Horror Story” on FX. The last time we checked in on the Harmons and the Murder House, we were looking forward to how the show would wrap up its deliciously dark first year. Did the last chapter, cut down from two hours to 90 minutes, bring a satisfying close as well as set the stage for season two? For TV Tuesday, we first visit with our old friends at Carmichael Industries. We’ve been watching “Chuck” on NBC since the beginning, and the geek-positive show’s Comic-Con panels are always a high point. But this season will be its last. Is the series making the most of the time it has left? Then we jump over to FX, and weigh in on the season finale of “Sons of Anarchy.” This fourth season is one of the strongest yet, but how well did Kurt Sutter and friends both wrap things up, and set the stage for next year? 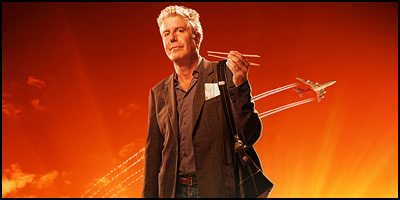 Snarky food writer Anthony Bourdain often mocks colleagues like Samantha Brown and Rachael Ray. So how will he fare in a new Travel Channel series where he must also provide a practical, accessible foodie guide to international destinations? While “No Reservations” was a travelogue of his distinctly Tony-flavored adventures, “The Layover” tries to highlight things everyday people could experience. Then, we weigh in on the fall half-season finale of “The Walking Dead” on AMC. We’re still fans (or, at least, Ryan still is), but we’re worried, especially compared to where we were after the six episodes of seasone one. While the last few seconds of episode seven earned a resounding “holy freakin’ crap,” was it enough to make up for the decidedly slower pace and limited character development we saw for most of season two?